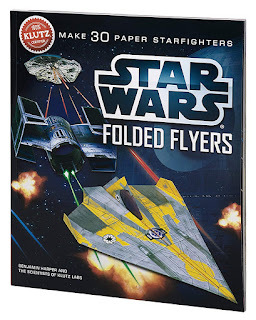 HURRY over to get this Klutz Star Wars Folded Flyers: Make 30 Paper Starfighters Craft Kit for ONLY $9.01 (Retail $19.99)! For the first time ever, you can fold Star Wars flyers that fly with the force. Star Wars Folded Flyers will speed through the living room as well as they do in outer space. That's because each of the six-starfighter designs has been rigorously tested by the Klutz Aerodynamics Team. And they look as great as they fly, because they're made from full-color, custom-designed papers - representing galactic vehicle exteriors, authentic to the last bolt. With five copies of each design, kids can have a fleet of Y-wings and X-wings at their command.